SCORE’s 2018 “The Megaphone of Main Street: Women’s Entrepreneurship” data report surveyed women on their successes and challenges in running their businesses. Our fourth infographic based on this data report focuses on how women start businesses, why they start businesses, and why they chose the industries they did. Why do women start businesses when they do? 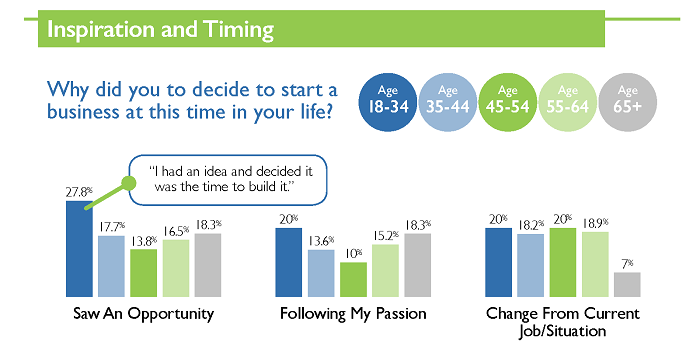 Women from ages 18 to over 65 were asked why they started their businesses when they did. The women noted an open opportunity, passion, a job change, experience and education in their chosen field, family considerations, and necessities such as layoffs and looking for extra income. When comparing the women’s ages and the reasons they opened a new business, two points stand out in the data. Twenty-eight percent of business owners under age 34 started a business based on seeing an opportunity in the market, and 28% of owners over age 65 started a business out of necessity. Aside from opportunity and necessity, the next highest reason women opened a business was family considerations for both the 35-44 (23%) and the 45-54 (26%) age bracket. Both shared very different family-driven reasons for starting their businesses. What industries do women choose and why? When asked about financing, a whopping 73% of women said they were self-financing their business, while 27% sought outside financing. One woman who sought funding said she wanted to build business credit, while another wanted to expand and grow faster than the organic rate. Some of the 73% who were self-financing did not think they could find financing. Whether it’s tech, construction, or anything in between, women of all ages from all over the country are creating their own businesses for a multitude of different reasons. Read the rest of “The Megaphone of Main Street: Women’s Entrepreneurship” data report and see the previous three infographics. If you’re looking for someone to help you start your business, reach out and get a SCORE mentor today. We would love to walk you through the details and help you get your business off the ground! Bridget Weston Pollack is the Vice President of Marketing & Communications at the SCORE Association.